The attack on retailers continued last this week when J.C. Penney Co posted a decline in sales at same-stores during the months of November and December, just the latest chain of department stores adding to the malaise in the retail sector as shoppers increasingly shun brick and mortar locations to shop online. Shares at J.C. Penney fell by 5.9% in early Friday trading, hitting the lowest price in the past seven months at $7.40 per share. The report by J.C. Penney came only one day after its biggest rivals Macy’s and Kohl’s said their sales at same-stores had fallen as well during the always crucial period of holiday shopping. Along with shifting to retailers online that includes the e-commerce giant Amazon.com, less spending on apparel, a department stores’ top driver of sales, has weighed heavily on the retail sector. J.C. Penney posted a drop of 0.8% in sales at same stores during November and December. Last year, the retailer posted an increase of 3.9% in its holiday sales at same stores. However, the company maintained its earnings target prior to EBITDA of just over $1 billion for its fiscal year 2016 that ends this month. 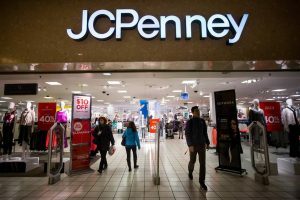 In a prepared statement, J.C. Penney CEO Marvin Ellison said that during November, the first three weeks were challenging for the company’s stores. Ellison said that weakness in the company’s women’s apparel area continued impacting sales, but that an improvement starting from the Thanksgiving holiday week through December 31, driven by an increase in demand for products such as boots, toys and appliances, helped to make up for some for the slow period to start November. Early promotions for the holiday shopping season and expectations amongst consumers that retailers would always have deals available took a toll on November sales, said analysts on Wall Street. It had been forecasted by the National Retail Federation that the holiday sales period for 2016 would see an increase in sales of 3.6% to end the period at $656 billion, due mainly to an increase in shopping online. Last week Amazon called its holiday season of 2016 its best yet. Some investors in the sector of department stores are willing to allow stores such as Kohl’s, Macy’s and other large chains additional time to turn things around, citing a number of positive strategic changes thanks to the huge shift to online spending.